As an instructor for the U.S. Postal Service, I often taught classes where 40 executives would spend two weeks at our executive center learning about all functions of the company and gaining a familiarity with the business of business. More than once, an executive would ask me what the cost of this experience was to the company. Now, the direct costs were easily calculated, so I would follow up with "What costs besides travel costs?" These people were asking about the loss of effectiveness to their organization due to their absence. They were serious, and I was aghast at their presumption. In truth, their operations probably breathed a sigh of relief, and effectiveness likely increased. That was when I was much younger and still had some innocence. Since then, I have had opportunities to address groups of all sizes on employee motivation, leadership development, actionable metrics, process improvement, etc. I am most interested in helping people learn about themselves as the first step toward helping others to grow. I employ a simple exercise during a presentation, couched as a stretch-the-legs exercise. I ask all attendees to stand up. Then, I begin a little audience participation. I ask that those who believe things at home will not go as well while they are at this meeting to sit down. I then ask those who believe that a full week’s absence will have no effect or loss to output to sit down. Then two weeks, then four weeks … OK, how about six weeks? With about 15 percent of the audience standing, I then ask all to sit down. 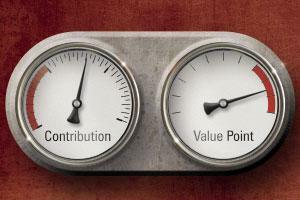 "Each of you has defined what you perceive to be your value point for your organization. This is where you decided that your unique contribution to the company comes into play." Each of the attendees has a unique situation by which they may rationalize their value point, and indeed it could be situational. The message here is that some managers were standing at six weeks. What could each person individually do to revise his or her value point? How do people define their unique contribution(s)? In studying management, Peter Drucker brought up the concept of a person's "unique contribution" to his or her company. This is what identifies that person’s value. It could be unique experience, knowledge, passion, talent, relationships, skills, abilities, interpersonal abilities, political savvy, etc. Is it truly unique? Will it pigeon-hole the person or affect his or her career? What effect does it have on the person's subordinates, peers or superiors? How does he or she exploit it (for power, to destroy or to help)? What happens if this person was hit by a truck and lost to the organization? In "Leadership is an Art," author Max De Pree tells about the retirement of a college custodian. Several hundred people showed up, and selected former students spoke. All present testified to the effect this custodian had on their lives. He was a true listener with an understanding heart who always had time for students. His gift was an ability to guide students to make their own decisions and develop their confidence as directors of their own lives. The speakers included a general, CEOs and "regular" folks. What was his unique contribution and how did he use it? What was his value point? Do you use your unique contribution as the custodian did?